Hi, I’m Ron. This is where I come to draw my stories and post other stuff and junk. Well firstly, I chose the name because it sounds cool and the domain name was available. Second, I think that it describes me pretty well. I used to really enjoy drawing and doodling when I was a kid, though I have no previous experience in creating manga. One day the idea just popped in my head. I just thought to myself that this could be something that I could enjoy doing and that it might prove to be a rewarding project. Naturally, the activity itself is a reward on its own but I wouldn’t mind making money off of it if and when I become good enough. So I’m taking the plunge head first. Stories prepare to be drawn! Naturally I also like watching Anime. I couldn’t get enough of it. It’s actually what drove me to attempt to create my own stories. 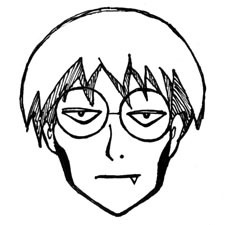 This is Madarame from Genshiken. I kind of see myself as someone like him. The difference is he has friends and a job. Today, I Am a Manga Artist!